They were there, of course, to greet their beloved guru Srila Prabhupada, who appeared presently, effulgent and regal with his silver-topped cane and bright orange sweater. Diving to the floor to offer their respects, the devotees piled flower garlands about his neck and fanned him vigorously with peacock feathers. Now, he could see progress being made. The devotees riding with him pointed out new buildings, including one under construction next to the existing temple that would house workshops and a large capacity hall for festivals. There was also a new barn, and a silo for grain storage. Prabhupada smiled. “Oh, much improvement,” he said. 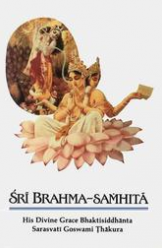 Then, as kirtan rang out once more, he departed for the house of Vahna Das and Hladini Dasi in Madhuban, where he would reside throughout his eleven-day stay until July 2nd. Prabhupada’s health proved troublesome during his visit — he suffered from heart palpitations and often had to miss morning walks. But his leadership was as strong as ever, as he emphasized the five primary things he wanted New Vrindaban to be known for: cow protection, simple-living, holy pilgrimage, spiritual education, and above all, loving Krishna. Close to cow protection, of course, is simple living. Prabhupada often extolled the virtues of New Vrindaban’s simple living and high thinking in contrast to all the endeavor modern man puts into gaining sense gratification, thus forgetting the real purpose of life. He visited the community’s different gardens, appreciated how Sri Sri Radha-Vrindabanchandra were bedecked with fresh wild flowers, and was delighted to receive wildflower garlands himself. While taking his morning walk with disciples in the “forest” of Talaban, Prabhupada encouraged devotees to buy as many of the neighboring parcels of land as possible to cultivate. And he appreciated when they showed him that they were growing their own hay for the cows, cutting their own lumber, and growing some of their own vegetables. Prabhupada further encouraged devotees by enjoying “The Spiritual Frontier,” a film about New Vrindaban, so much that he watched it twice. Produced by Yadubara and Visakha, it was vividly colorful and beautifully shot. It showed the “Brijabasis” living a Krishna conscious life while harvesting crops, picking fruit from the trees, and preparing natural milk products. It was clear that Srila Prabhupada wanted others to visit New Vrindaban as a holy pilgrimage site, and he treated it as such himself. During his stay he visited not only the main Deities of Radha Vrindabanchandra in their temple, but also the other Deities worshipped in different parts of the community, just as one would during a pilgrimage of the original Vrindavana in India. He was most eager to see Sri Sri Radha Vrindaban Nath, the Deities at the original farmhouse where he had stayed during his first visit in 1969. The farmhouse was now a brahmachari ashram, and when they heard Prabhupada was coming, the men there burst into a frenzy of activity, trying their best to clean it up for him. As he walked up to the house, the atmosphere was electric, with many devotees including gurukula children lining the pathway to greet him. Prabhupada was happy to be back. With folded hands, he took darshan of the small but beautiful Radha Vrindaban Nath while the Govindam prayers played, then gave the morning Bhagavatam class from a rustic-looking vyasasana. He also visited the site of a future place of pilgrimage – the Palace his disciples were building for him. It was his second visit (his first had been in 1974), and now most of the concrete work was done, and the finishing work started. He was very appreciative and impressed that the devotees had done all the work themselves, especially since most were not professionals but had learned on the job. Prabhupada remarked that they were working with the special inspiration of God. Prabhupada added that the Palace, a combination of Eastern and Western architectural ideas, was unique in North America and that people would therefore come from all over to see it. Another thing Prabhupada focused on while in New Vrindaban, as he did everywhere, was imparting spiritual education to his young students. He did it all the time, whether he was giving the morning Bhagavatam class or receiving a massage outside in the noonday sun. His disciples’ most cherished times with him, however, were his intimate evening darshans in the garden at the back of his house, during which his congenial mood deepend their love and affection for him. On those idyllic summer evenings, the devotees gathered in a semicircle on the grass before Prabhupada, the sun’s golden rays filtering through the trees and casting a dappled pattern on his yellow satin vyasasana with its lion armrests. 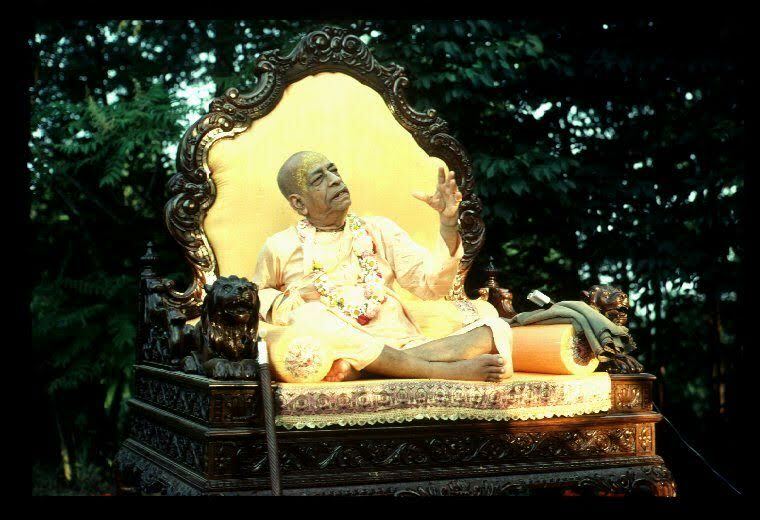 Prabhupada would be reluctant to take his own seat until he saw that all the devotees also had mats to sit on. Once he did, he would instigate debate on challenging issues, with them taking on the role of materialists and Prabhupada arguing from the Krishna conscious point of view. 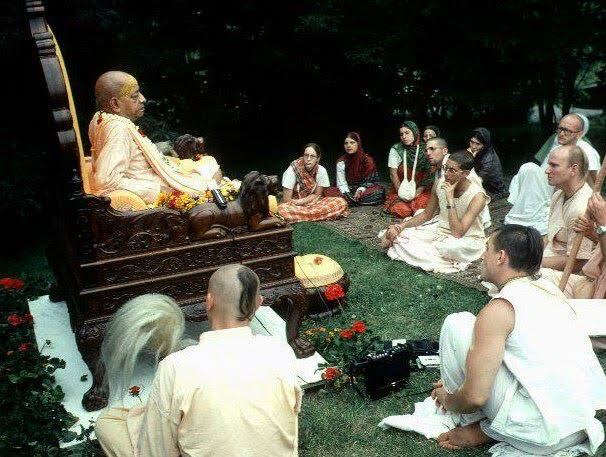 Prabhupada also supported New Vrindaban’s own efforts at spiritual education by visiting its gurukula. There he received guru-puja in a packed temple room, with the young saffron-clad boys crowding in front of him. It was another incredibly sweet experience, with Prabhupada playing his gong and throwing flowers over the devotees as they jumped and shouted excitedly. 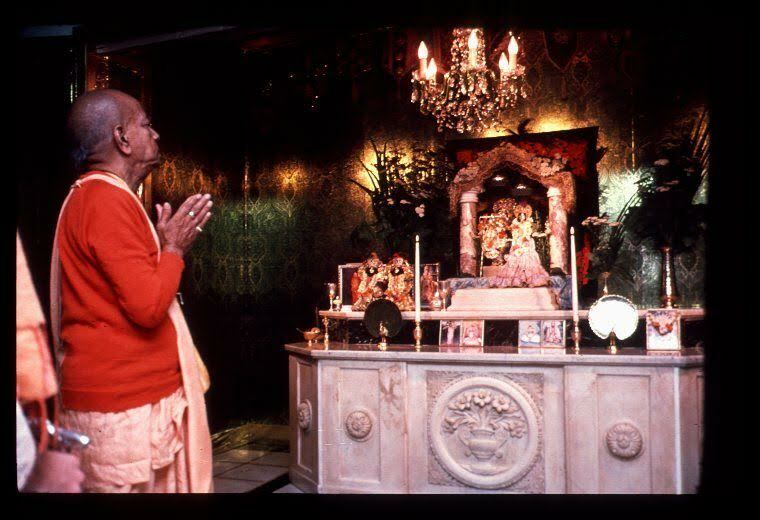 Throughout his entire visit, Prabhupada showed his disciples how to love Krishna – the connecting thread of his five-part vision for New Vrindaban — by everything he did and said. It was in the way he looked at and spoke about Radha Vrindabanchandra, completely convinced that full happiness would come through serving Them. It was in the way he cared for Krishna’s devotees, making sure they were comfortable and warm during his evening meetings. And it was in the way he saw Krishna everywhere – once he compared young “Brijabasi” boys running alongside his car to Krishna and Balarama racing with the birds in the fields. Love of Krishna was even the last message he gave New Vrindaban devotees face to face, imploring them during his final class on July 2nd to become servants of Krishna instead of servants of their senses. By doing that, he said, their lives would be successful. After his class, the devotees held one last rousing kirtan. The little gurukula boys danced enthusiastically, then clamored about his vyasasana, shyly holding out their hands as Prabhupada passed out cookies to them. That afternoon, everyone gathered outside the temple to bid farewell, presenting him with a cake and a donation. Then, as his car pulled out onto the road, they showered it with flowers, calling out “Jaya Srila Prabhupada!” at the top of their lungs as it faded away into the distance. It would be the last time New Vrindaban devotees saw Prabhupada physically present in their community. 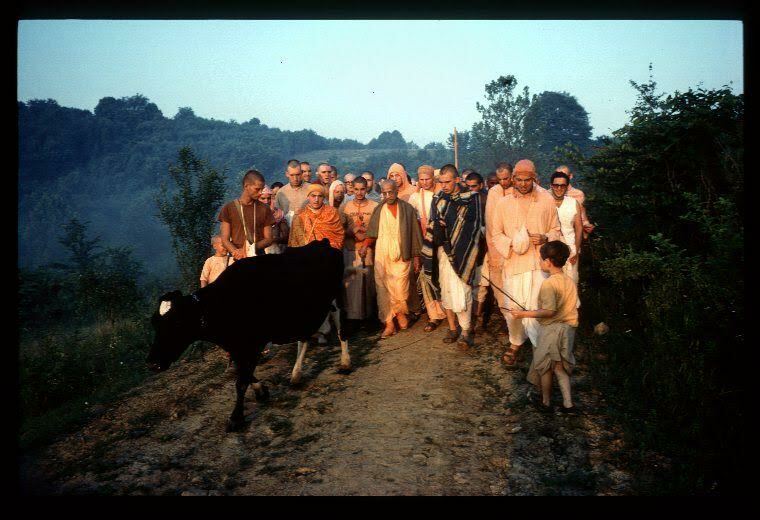 But they had implicit faith he would be with them forever through his instructions, firmly imprinted in their hearts, as they continued working together cooperatively to realize his grand vision for ISKCON’s first farm community and holy place of pilgrimage.